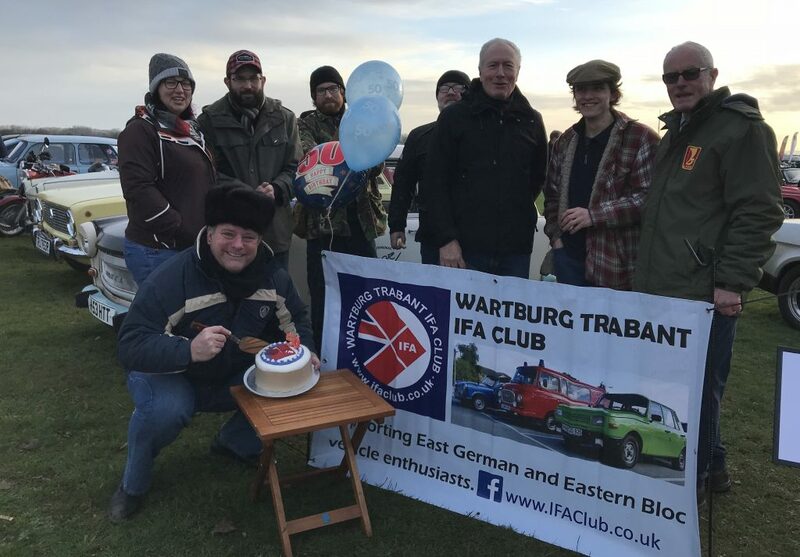 The Wartburg Trabant IFA Club UK launched its 50th anniversary year in traditional style with tea and cake at the first Bicester Heritage Sunday Scramble of 2019. Appropriately dressed for the weather in an authentic Soviet fur hat, Club Chairman Mel Holley cut the birthday cake and welcomed members and enthusiasts to the Club’s pitch with an offer of tea, coffee or hot cocoa. 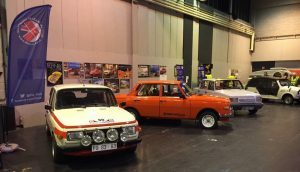 Among the IFA vehicles making their debut on the Club display were a rat-rod style Trabant Kombi 1.1 well-known on the VW scene, and a pair of restored MZ motorcycles. The heavily-modified Wabant which drew the crowds at the 2018 Lancaster Insurance Classic Motor Show proved equally popular at the Oxfordshire airfield. Mel said: “We couldn’t have asked for a better launch venue for our 50th anniversary year than the Bicester Sunday Scramble. 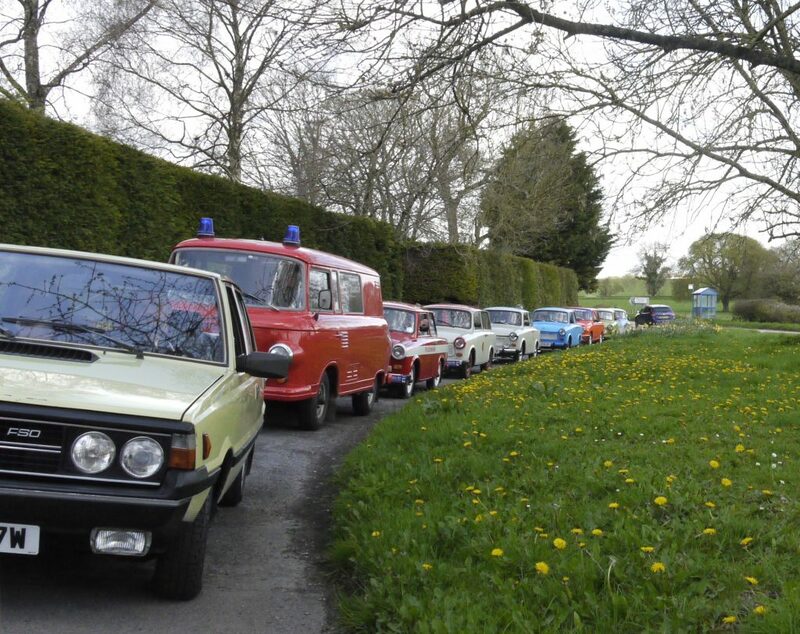 “Like Bicester, the IFA Club takes pride in our heritage but is determined to make classic motoring relevant and accessible to today’s motoring and motorcycling fans. 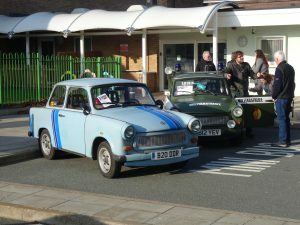 The University of Chester and the Wartburg Trabant IFA Club UK teamed up to bring an experience of life in East Germany to Cheshire. 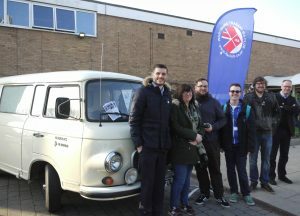 Eight IFA vehicles, from a Barkas B1000 van fresh from the Club stand at the Lancaster Insurance Classic Motor Show, to the last East German Military Police staff car still on the road, arrived at the University of Chester’s Kingsway Campus to support the Totally East: Life in East Germany exhibition of documentary photographs by Harald Hauswald. The exhibition was organised by the University of Chester’s Department of Modern Languages and Department of Art and Design. 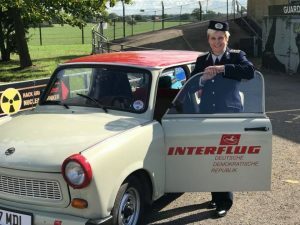 University of Chester Modern Languages undergraduate Austen Lowe seized the opportunity to tour the local streets in IFA Club Chairman Mel Holley’s Trabant 601. Austen said: “The exhibition gave a true insight into life behind the Iron Curtain, while the IFA Club’s presence made the event so authentic and fascinating. 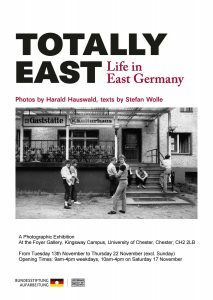 IFA Club Chairman Mel Holley said: “Club members found these unique photographs depicting everyday life in East Germany absolutely fascinating, and we really enjoyed the opportunity to chat about our cars and the Club with Chester students and residents. The exhibition was also attended by Ian Sanders, the creator of the popular Cold War Conversations podcast. Ian interviewed Richard, Austen, and several IFA Club members for his latest episode. 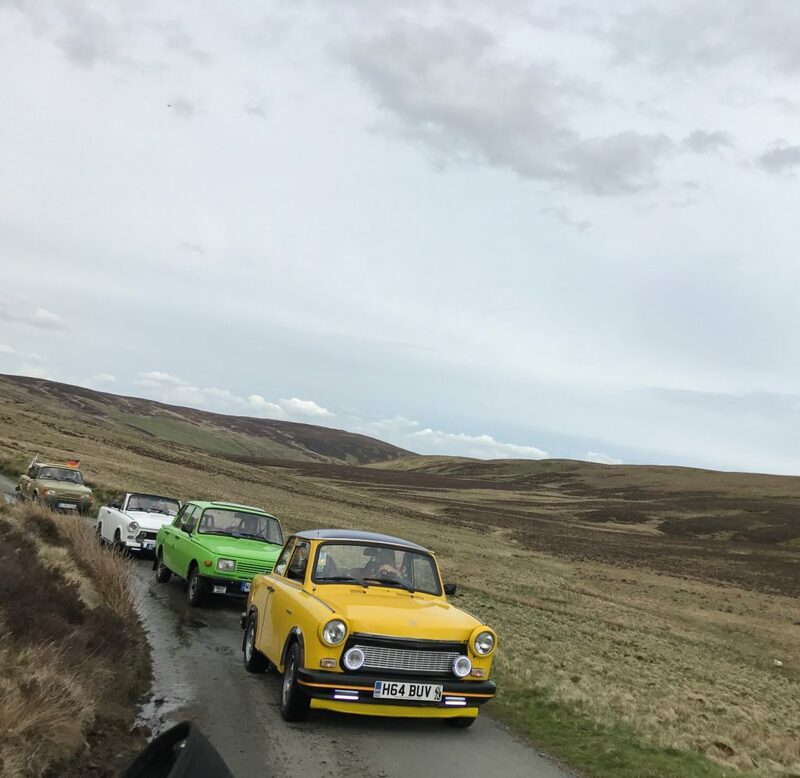 Friend of the Club and owner of a Wartburg 353 in Volkspolizei livery, author David Young will be in conversation with Cold War expert Dr Richard Millington during this year’s Chester Literature Festival. David will be speaking about his Stasi Child series and the in-depth research he carries out to explore the real-life stories that inspire his books. Stasi Child, the first in the series featuring Oberleutnant Karin Muller, was a Times Crime Book of the Month and a Telegraph Pick of the Week, as well as winning the 2016 CWA Endeavour Historical Dagger for best historical crime novel. 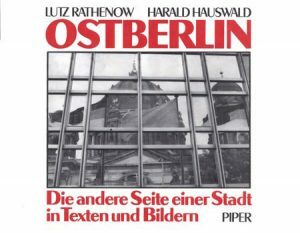 Muller’s story continues in Stasi Wolf and A Darker State. 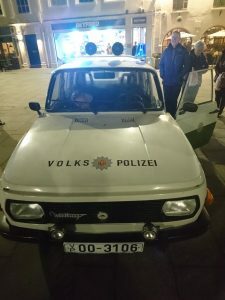 The fourth in the series, Stasi 77, is expected in early 2019. 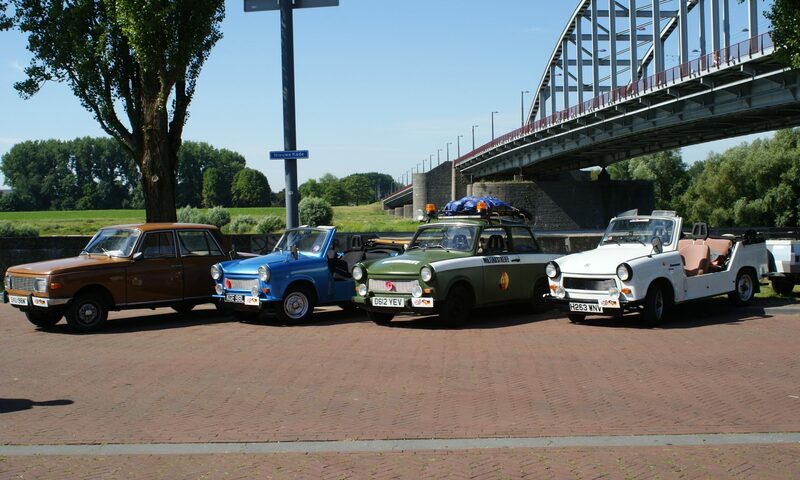 Follow David on Twitter (@djy_writer) for more about his novels, and his Wartburg! * David and Richard will be in conversation on Thursday 15 November at 6pm. The event is free but tickets need to be booked.